Math Tutoring Experts assist students in colleges primarily in the levels of freshman and sophomore mathematics courses. Primary level courses such as Prealgebra and Algebra lay the foundation for other mathematics courses to follow. Math Tutoring Experts provides extensive assistance for students who are taking these beginning level courses. Other college level based courses such as Pre-Calculus, Calculus I, Calculus II, Calculus for Business Majors, and Statistics are also major courses in which MTE provides service. Advanced mathematics courses such as Multivariable Calculus, Linear Algebra, and Differential Equations are also offered but at advanced requests. In addition, these courses are only offered on weekend afternoons. Many of these math courses can simply be requirements for students who have declared majors in different fields outside of mathematics or sciences majors. In order for students to proceed with their major, it is imperative that students have a strong foundation in their required mathematics courses. This is one of the primary objective of Math Tutoring Experts! Helping students achieve their goals! Whether you’re a mathematics major or just need to complete a math course, we are here to help. Giving students a resource in which they can count on is critical not only to their mathematics objective, but also to their overall well-being as well. Math Tutoring Experts is your trusted source for assistance in all of these various mathematics courses. To begin, please contact the Getting Started Page. A MTE representative will contact you shortly to discuss your math tutoring needs. 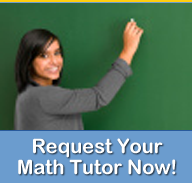 Math Tutoring Experts is your trusted source for all of your mathematics tutoring needs!